On September 22nd, 1978, The Ramones unleashed their fourth album on the world: Road to Ruin. 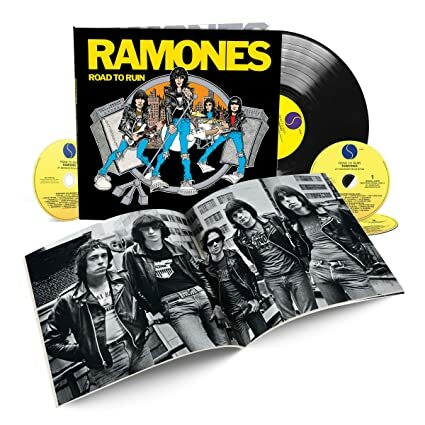 On September 21st of this year, almost forty years to the day, Rhino Records will reissue Road as part of the label’s ongoing series of Ramones box sets. It will arrive as a 3-CD/1-LP box set and a single-CD remaster of the original album. For Road to Ruin, Dee Dee, Joey, and Johnny were joined for the first time by drummer Marky Ramone (who replaced founder Tommy Ramone, who’d left the ranks to focus on producing and writing for the band). The album introduced the now-classic “I Wanna Be Sedated,” which is just one of the tracks that will be heard in never-before-released versions on the 40th Anniversary Deluxe Edition. Disc One of the box set has the remastered version of the original album mix along with a 2018 stripped-down “Road Revisited” remix crafted by original producer Ed Stasium. This remix is also included in the set on a 180-gram vinyl LP. CD 2 boasts period rough mixes of every album track as well as bonus material such as single versions, backing tracks, two outtakes (“I Walk Out” and “S.L.U.G.”), the 1988 “I Wanna Be Sedated” Ramones-on-45-Mega-Mix, and more. The third CD premieres a 1979 concert recording from the band’s homebase of New York, captured at the late, lamented Palladium and first broadcast on WNEW-FM. The limited and numbered edition of 7,500 copies worldwide is packaged in a 12×12 hardcover book-style format. Author Roy Trakin, album cover artist John Holmstrom, and Stasium have all contributed essays to the booklet. Photos and rare artwork are also featured, including an alternate cover for the album.